I was born in 1954, the same year that Rationing came to an end, 9 years after World War II. Rationing, first introduced in 1940, had an inhibiting influence on many young people, people like my parents. During those 14 years of rationing they went from being teenagers to meeting each other, to courting, to eloping, to marriage, and then to having 3 children. They had been conditioned ‘to make do without’ – it had been instilled in to them during those all-important years – so the end of rationing did not make much difference to their thinking. 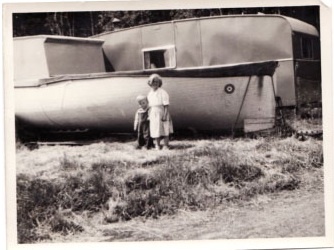 The caravan I was born in, just North of Inverness in The Highlands of Scotland, had no running water, or electricity and relied on paraffin for heating, lighting and cooking. I was brought up to believe that there was a limited amount of wealth in the world. If someone was lucky enough to have something, it involved another having to go without. One person’s addition was the result of another’s subtraction. If a person was lucky enough to get rich, it was at the expense of another’s poverty. I developed an inhibition toward money believing that if I were good I would receive my fair share. That money was hard earned and if you needed more then you worked harder. If it came easy then it had been made unjustly or immorally. This thinking stayed with me until I was helping out at a large charity event. In the hubbub of idle chitchat a moment suddenly appeared when I found myself alone with the philanthropist who was making the huge donation. I remarked to him what a wonderful thing he was doing to donate so much of his hard-earned money. Before I could ask why, the philanthropist was whisked away by one of the organizers and I stood there for a full minute without moving. From that moment on I promised myself to change my thinking – though, to be honest, I did not have the least idea how to go about it. Yet there are times when someone says something or you read something, and though you are unable to substantiate it and have difficulty in accepting it, something resonates deep inside you as a profound truth. That’s when you recognize you are experiencing a ‘Turning Point’! I persistently searched and studied and I finally understood what the philanthropist had shared with me. Within 12 months my income had gone from a paltry £1,000 a year (this was 35 years ago – the equivalent today of £12,000) to £15,000 (the equivalent of £150,000 today). I discovered that the harsh reality of life is that most people have been conditioned to have a... WEALTH INHIBITION. The VERY OPPOSITE of the Force vital for Wealth Attraction! This is the number one reason why most people spend their lives just getting by! Wealth does not work under finite laws. It is vital to understand that your ability to attract wealth does not mean there is a correlated subtraction of wealth from another. Money is like vocabulary: just because one person is fluent does not mean that you cannot be too - as if all the words are already used up. My formative years instilled a work ethic in me. But we do not suffer, or even die, from hard work we love; we suffer and even die from the hard work we hate. Correctly directed and backed by the right thinking, a work ethic becomes a valuable tool. The main point being that you work at something because you WANT to, not because you need to. Before you can attract money you must absolutely let go of every inhibition to wealth. That means forgetting the work-money link that you have been conditioned to believe. It means to no longer be intent on getting, or being content with, receiving your fair share. It means accepting once and for all that your addition to wealth is not due to the subtraction of wealth from another. Just because some people have no money, has absolutely nothing to do with you or the wealth you attract. Some people will never have enough to make ends meet – because they will not change their thinking. It is not something you must ever feel guilty about. To attract wealth you must find it attractive – like it – want it. When you have it you can give it away however you wish. While you don’t have, do not begrudge those that seem to you to waste it, or envy those that do with it what you would like to do. Wealth inspires you to do whatever you want, whenever you want. Recession does not affect you when you are wealthy. When you have 4, 8, 20, 30, 50 or 100 million, and it reduces by half to 2, 4, 10, 15, 25 or 50, it does not impede your lifestyle. You are still wealthy, and as wealth attracts wealth, you very soon increase it. Recession, of which I have experienced 3, only influences the thinking of those that are susceptible to it. I remember hearing a person at a dinner party saying how great it was that the wealthy were finally getting their just deserts. “They will have to learn to live with their fair share – just like the rest of us,” he said gleefully. This is totally misguided thinking that is hazardous to your personal wealth. This type of thinking exemplifies an inhibition to wealth that will always ensure the repelling of it. You must understand that however much wealth you choose to accumulate is in no way influenced by economic affairs, interest rates, politics or war. The moment you let go of your inhibitions toward money, you turn on your full power for it to begin flowing toward you.